Last week (March 17, 2017) Disney premiered their long anticipated live action remake of the 1991 Beauty and the Beast classic animated movie. There was the expected hype about the music, their outfits, the possibility of a gay character, etc, but of course here on this blog we deal with only the most pressing, important features, i.e. Cogsworth the Clock! 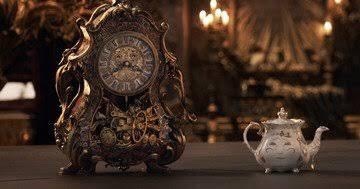 Above, Lumiere the candelabrum and Cogsworth the clock, and as fascinating as Lumiere was, let’s just take a look at Cogsworth for a moment. What ISN’T going on with that clock?! I’m not an art history specialist, so this research has been a learning experience for me. The structure of the case seems to be a red painted porcelain, though factually it would more likely be tortoiseshell. The style is reminiscent of furniture maker André Charles Boulle (1642-1732) whose last name became synonymous for works with his style. An example of a clock described as “Boulle” is shown below, for sale on the website here. I would call this shape a table or shelf clock, since it does not hang on the wall but is not shaped like a mantel clock. I’ve seen the shape described as a parlor table clock before. The Boulle style was common through the 19th century. Cogsworth has gold-colored trim as well. This could have been bronze or another metal with gold gilding. One name for this style is ormolu, which was a method of gilding bronze that was popular in the 18th century. It included evaporating mercury and thankfully was replaced with the method of electroplating, which gained popularity in the 19th century. Underneath the dial, on Cogsworth’s belly I suppose, is a number of instruments of war – a cannon, a bugle, a sword, etc. These come out to play later in the movie which I presume is why they’re there, because stylistically they make no sense on this clock. Cherubs, naked women, florals, etc., are all normal decorations on clocks of this time. Cannons, less so. Are there are clocks (real or fictional) you want me to blog about? Leave a message if you have a suggestion! And if you saw the movie, let me know how you liked it! dooms day clock post, please!